Kira Small and Bryan Beller. WESTWOOD CENTER – What happens when you marry a torchy singer steeped in old school soul with a bass player whose background is intricate progressive rock and, recently, cartoon death metal? That is literally, marry them? 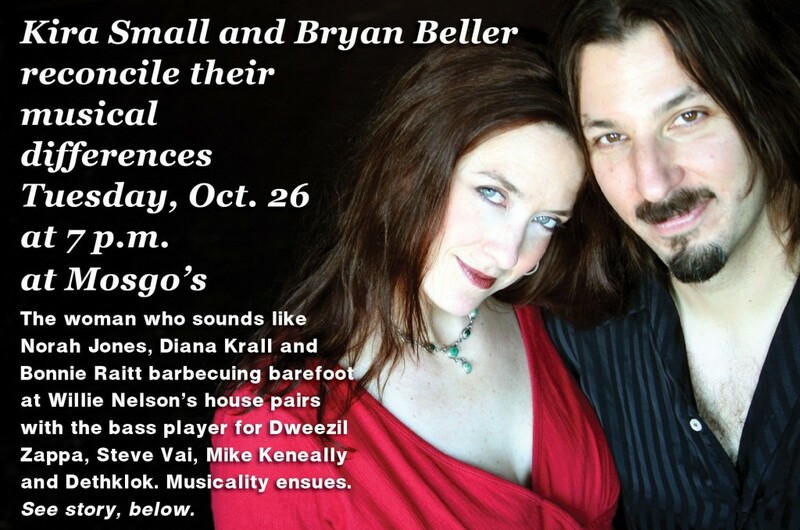 Among other enjoyable things, you get Kira Small and Bryan Beller appearing at Mosgo’s in Westwood Center next Tuesday, Oct. 26 at 7 p.m. The two are traveling up the West Coast, playing small venues and doing house concerts as part of Kira’s “Raise My Voice” tour. The last time Bryan was in town he was part of a very different duo – with multi-instrumentalist art rocker Mike Keneally at the Arcata Eye Ball in January, and before that, with Keneally’s fierce rock band a few years back. A lifelong musician, Small only recently gave all her energy to her own solo career. “I sang to myself in the playpen and have been at it ever since,” she said. After picking up piano in grade school, she studied jazz at Milwaukee School of the Arts. She and Bryan even attended the famed Berklee College of Music together, where they were friends and musical cohorts, but went their separate ways for 14 years afterward. At this point in the story, imagine calendar pages fluttering away, interspersed with images of Kira serving on Berklee’s Voice Faculty and amid a hefty gigging and session career in Nashville, working with folks like Wynonna Judd, Peter Frampton and Martina McBride, then recording her first two albums, and Bryan rocking out with super-shredder guitar gods Keneally and Steve Vai on various stages around the globe. Then, in 2005, the romantic musical’s key plot twist: a fateful re-acquainting in Los Angeles, culminating in marriage in Nashville in 2008. Among the classic artists who may find reinterpretation at Mosgo’s Tuesday are Bill Withers, Ann Peebles and Ray Charles. “Generally when we do covers, we reach pretty far back,” Kira said. So how does a guy who has played with the mega-metallic likes of Dweezil Zappa, Steve Vai, Mike Keneally and Dethklok approach the sultry strains of Kira Small music? With supreme comfort, possibly owing to strength in musical diversity. “We do trust each other musically,” Kira said. As she holds forth on keyboard and voice, Bryan holds down the bass, with rhythmic support, some “pretend, guitar-like” color and the odd solo. The result is full, but not overbearing. “I want people to have the intimate experience of a duo concert, but not feel like they’re missing anything,” Bryan said. Between songs, the two connect with the audience, making each gig its own experience. Kira’s MySpace page and YouTube offer examples of memorable performances around the country. In the clips, Kira stands at the keyboard as lead singer and banterer, while rocker Bryan, who has run around stadium stages in rock and roll mode, hefts his bass from a seated position at her side. That may explain his choice of analogies. This entry was posted on Saturday, October 23rd, 2010 at 9:26 am	and is filed under Scene, Featured, Featured Photo. You can follow any responses to this entry through the RSS 2.0 feed.